The fastest three months in the year for me are June, July and August. These three months, for me, go by in a flash. I love warm weather and when I was much younger the hot hot weather did not bother me a bit. And, I still love hot weather, I just wish I could be more active in the hot weather, but taking a break now and then is a must. The Cincy T-shirt Fest was fun, but not as profitable as last year. Two of my helpers thought that the heat had something to do with the number on people that came out on Fountain Square. All in all, I enjoyed selling my t-shirts and talking with t-shirt buyers. One nice surprise was the popularity of a new t-shirt design by my fellow artist friend Sam Hollingsworth. I was really happy to see people snap up these t-shirts. Perhaps next year, I will be able to offer another new idea. With August just being around the corner, I must get busy soon on Christmas. There are a few new ideas for products and I would like to see if they will fly. At the same time, I am working on a new painting. I have a local juried art show coming up in August - the Clifton Art Center is having a show to enter. Not that my political satire does well in Clifton, I, nevertheless, will give the judge of this exhibit the opportunity to pass on my work. I am also very excited about reproducing a stamp painting from 1991 as hand-pulled silk screen prints. I have been doing a little reading on the historical background of the silk screen process recently. The idea of producing a quality piece of art work, done by hand, at a reasonable price, seems to embrace all those elements an artist would want. 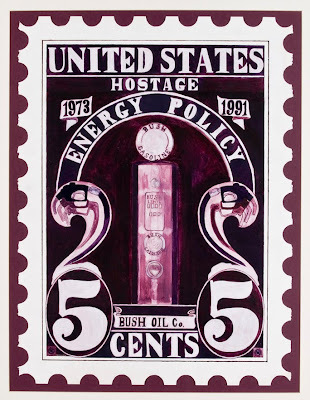 This particular piece of my art work, I have long believed, should be widely distributed because it speaks to the need for our energy independence. As a nation, in 1973, we should have come together politically and had a comprehensive energy plan to move towards energy independence. 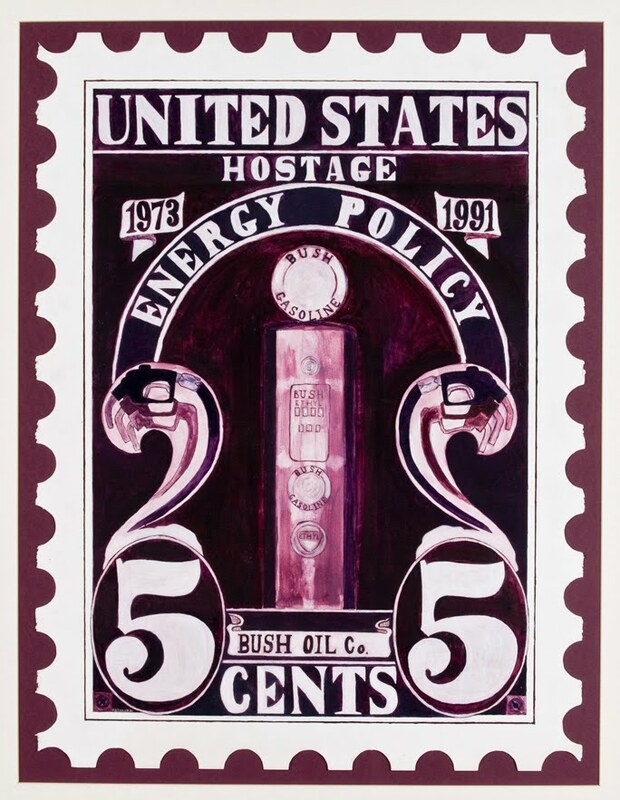 Expending American lives to keep oil flowing is an expensive endeavor as the conflicts we have been drawn in to can a test. I just read an article about a new catalyst which prevents the 'poisoning' of a fuel cell by carbon monoxide when using GASOLINE as the source for the cell. GASOLINE? Is it just me or have these idiots missed the point? I look forward to seeing your silkscreening process. I hope you blog it. I am sad that back-to-school sales are starting and those cicadas have started up already! That is a good idea Julie, and I will keep that in mind. I love the way you show your work in progress. I will give it a try. I love that you put your art on a shirt and make it accessible to everyone. And you know, this would make a pretty great summer stock post too ;).